LEBANON, Ohio – March 7, 2014 ? Buoyed by strong performances at a test Feb. 20-21 at Sebring International Raceway in Sebring, Fla., Doran Racing hopes for some excellent results in the second IMSA Continental Tire SportsCar Challenge (CTSCC) race of the year at the same track at 1 p.m. Friday, March 14. The Lebanon, Ohio-based team is campaigning two Nissan 370Z NISMO RCs in the Grand Sport class for the 12-event series this year instead of just one car. Although it’s double the work, running two cars also provides double the data, which helps the team fine-tune the cars’ set-ups in less time. This is especially important on race weekends, when practice time is usually short. The No. 14 is driven by Brad Jaeger, formerly of Cincinnati but now of Charlottesville, Va., and Cincinnati’s BJ Zacharias. The Tower Events No. 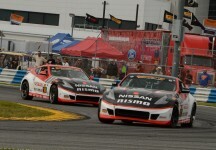 41 is piloted by two drivers from Toronto, Canada: 2012 series champions John Farano and David Empringham. Unfortunately neither car finished the season opener at Daytona. The No. 14 encountered a rare mechanical problem at the halfway point and the No. 41 was hit by another car on the first lap. “We were looking forward to at least one car having a solid run at Daytona and getting early points on the board, but it wasn’t to be,” said Zacharias. “There were some concerns with the 41 car after the hit it took, but the Doran Racing crew really did a fantastic job getting the car squared away. “The Sebring test was good for the team and the drivers, especially having the results we did during the two days,” added Zacharias, referring to the fact that both cars were consistent front-runners throughout the test. “We worked very hard over the four sessions and came up with a game plan going forward. “I truly feel the addition of the 41 car to the team really paid its dividends during the two-day test,” he said. “It enabled both cars to feed off of changes on chassis set-up, and it really is making both cars better. “We definitely had a productive test at Sebring in February,” concurred Jaeger. “I think everyone was struggling for grip after a few laps, so the key to this race will be finding a set-up that keeps the car balanced and drivable after you lose that initial grip. 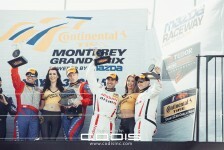 “The last time I raced at Sebring, I set a new track record in a Pro Star Mazda and qualified on pole,” Jaeger noted. “We’ll see if I can have a repeat in qualifying this year! Empringham agreed the test went well, but noted that BoP (balance of performance) is a hot topic in the series at this time. BoP refers to technical regulations the series imposes on different makes of cars in the hopes of equalizing the competition. They usually involve weight allotments and limits on horsepower, engine management and aerodynamics. At press time there are 27 entries in the GS class and 33 in the ST class for a total of 60 cars in the race. Sebring is a 17-turn, 3.74-mile track that is noted for being bumpy. Practice at Sebring for the CTSCC series starts on Wednesday, March 12, with qualifying at 1:20 p.m. on Thursday, March 13. The two-and-one-half-hour race stars at 1 p.m. Friday, March 14. 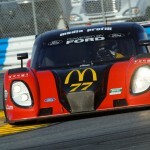 It supports the Mobil 1 Twelve Hours of Sebring. The event’s entire schedule can be found on imsa.com. Live timing and scoring and other information will be available on that Web site too. The race will be broadcast on a tape-delayed basis on Fox Sports 1 at 1 p.m. Eastern time March 19, and rebroadcast at 7:30 p.m. March 23 on Fox Sports 2. * In the “small world” department, the fathers of co-drivers Brad Jaeger and BJ Zacharias attended the same high school, Aiken High School in Cincinnati. Fred Zacharias was two years ahead of Jim Jaeger and they didn’t know each other until later, however. Brad Jaeger and BJ Zacharias attended different Cincinnati-area high schools: Brad is a graduate of St. Xavier High School and BJ was graduated from Turpin High School. * The town of Sebring, Fla., was founded in 1912 by George E. Sebring, a pottery manufacturer from Sebring, Ohio, which is about 200 miles from Doran Racing’s headquarters.